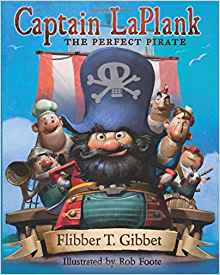 In Captain LaPlank: The Perfect Pirate tells the story of LaPlank as he sets out on adventure with his crew. Mistakes are a normal part of life – stuff happens all the time but it is how we react to these mistakes can make or break us as individuals and our relationships with others. In this book, LaPlank expects his crew to be beyond perfect – mistakes are never ever allowed to happen and if they do, you walk the plank! No one can do their duties or perform well under these extreme expectations and LaPlank’s crew is no exception. One by one they each make mistakes and it is their turn to walk the plank. It isn’t until there is no one left and the Captain has to perform all the duties, that he realizes how unfair he has been. Especially when he finds his own mistake! He learns the error of his way and returns to find his crew and make amends. This was an excellent, funny book for children. They will laugh at the antics of the Captain but at the same time they learn an excellent lesson on understanding, acceptance and forgiveness. Out of every mistake, we learn something so we should never be afraid to try and make a mistake. Too often children don’t feel this, they feel overwhelmed to be perfect. It is important that they understand that perfection is impossible standard to have, instead we should embrace mistakes and share a good laugh over them. This would make a great starting point for parents to have a conversation with their child about mistakes they made, how they fixed them and moved forward. You can purchase a copy of this book on Amazon. Learn more about this book here.